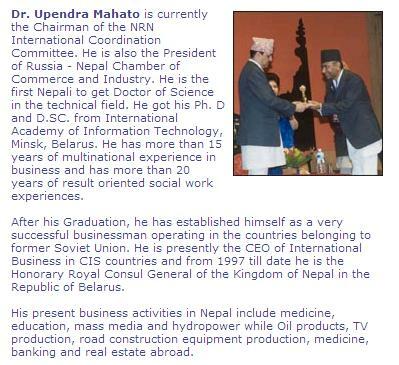 Upendra Mahato launched the Non Resident Nepali (NRN) movement worldwide. There are some great ideas that have come out of it. He has been pouring enormous amounts of time into this effort. It is love for the country. Dual Citizenship: This is the single most important thing Nepal can do to draw in FDI - Foreign Direct Investment - into the country. You can send Nepali labor abroad, or you can bring in money from outside and create jobs right there in Nepal. In my opinion there is no such thing called bad FDI. The more the merrier. Most of the Chinese FDI comes from the Chinese diaspora. And China seems to beat everyone else at the game. So why has Nepal not done it yet? I think the NRN Association has picked a great issue, and has done some impressive lobbying. It should take the next step. It should hire lawyers in Nepal and actually write up the policy itself. It should engage in a more effective lobbying than has been the case so far. The political elite in Nepal is opposed to the idea of the Nepali diaspora playing a bigger role in Nepal. They harbor this inferiority complex. I wouldn't care much about it except that it hurts the Nepali people, and that is why it has to be countered. Globalization is the wave in the world today. And if Nepal is to make the best of it, the country will simply have to get seamless with its diaspora. And this does not have to wait until the country gets itself a new constitution. It should be done now, without delay. This has been another NRNA idea. I have not had a chance to study all its details, nor do I know where I would go online to do that, but the idea is basic, and it is great, although it has not really taken off in a large way, and so might be subject to some critique. The number one reason I think is the lack of the dual citizenship regime and the associated lack of policy framework in Nepal, but there are also other reasons. At some level there is also the issue of Madhesi leadership. And then the issue of the lack of an entrepreneurial culture among the Nepalis in America. It is dazzling. It was amazing to me how little the Nepalis in America gave to the fund for the injured in the April Revolution. Perhaps the bond between Nepal and the Nepali diaspora in America is exaggerated. Also perhaps the fund can start out small, and show the work, and then hope to grow bigger. Or there can be more than one fund. There also is perhaps a need for private sector efforts for the same. The whole thing is a package deal. So many different things have to go right at once. But that is no reason to not try. So I greatly admire the NRNA people who have been taking the lead on this one. Despite Mahato himself leading the NRNA, I still feel there is this anti-Madhesi thing going on there. Say if you come up with the idea of setting up one job training center in each of the 75 districts, that is wrong. Half the people live in the Terai, but they will get only 16 of the 75 centers. So I say ignore the districts and zones, and instead go by population. The fund could also become clearer on the portions of it that might go not for private sector investment, but for social service work, namely investments in education, health and micro credit. These Russian/Soviet Nepali entrepreneurs sure make us proud. And they sure have taken the lead. Nepalis in America should gang up with them, and turn the country around. 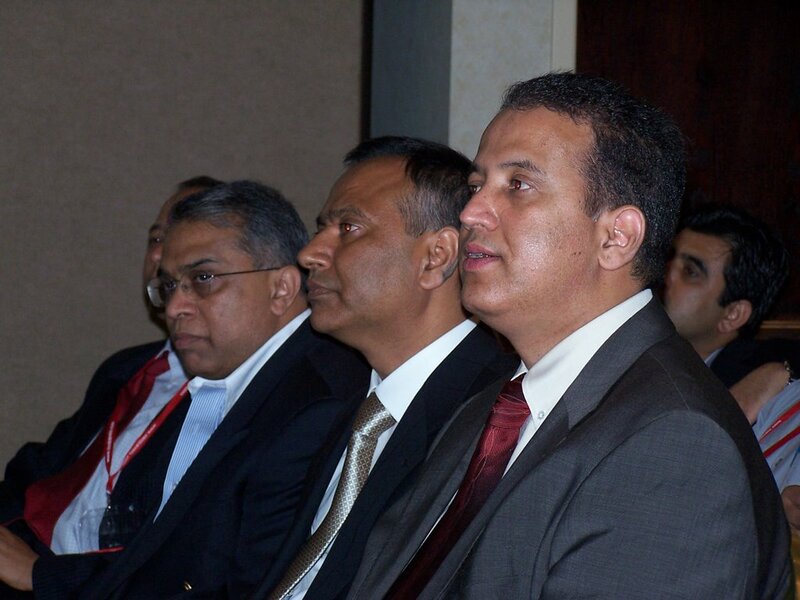 The richest, professionally accomplished Nepalis end up "natural" leaders. 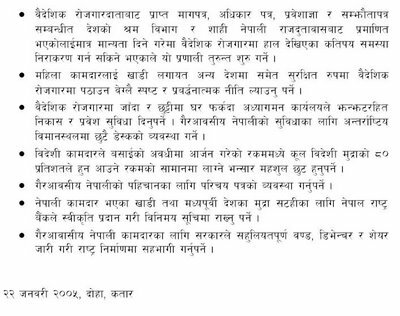 My number one gripe with the Nepali organizations in the diaspora is they are not mass based. There should be elections. Organizations should go on membership drives. Perhaps some of the same people will get elected, and that is just fine, but elections should be part of the culture. Otherwise it is like when they founded America, only the landowning white males were allowed to vote. We all now know that was not okay.